Getty ImagesIt costs a lot of money to open a McDonald’s restaurant. McDonald’s franchisees must make an initial investment of between $US1 million and $US2.2 million. 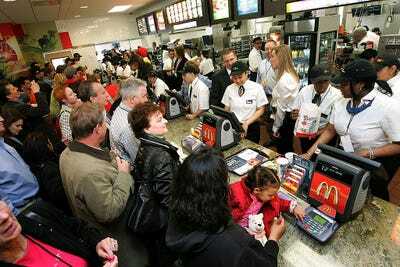 McDonald’s charges a $US45,000 franchisee fee and an ongoing monthly service fee equal to 4% of gross sales. The average McDonald’s restaurant generates $US2.6 million in sales annually, making it the fifth-highest-grossing chain in the US by sales per unit behind Chick-fil-A, according to QSR magazine. But to open a single restaurant, the company requires that potential franchisees have liquid assets of at least $US500,000. Startup costs, which include construction and equipment expenses, average between $US1 million and $US2.2 million, according to McDonald’s.The total is determined by the geography and size of the restaurant, as well as by the selection of kitchen equipment, signage, style of decor, and landscaping, the company says. In addition to those costs, McDonald’s charges a $US45,000 franchisee fee and an ongoing monthly service fee equal to 4% of gross sales. Franchisees must also pay rent to the company, which is a percentage of monthly sales. Subway, by comparison, is far less expensive, costing between $US116,000 and $US263,000, according to the company.